This description is from Nancy, the museum’s director of the Cockrell Butterfly Center and curator of entomology. She’s chosen a selection of objects that represent the rarest and most interesting insects in the Museum’s collections,that we’ll be sharing here – and at 100.hmns.org– throughout the year. This spectacular, iridescently colored moth is considered by many to be the most beautiful of all Lepidoptera (the order of “scaly winged” insects, i.e., butterflies and moths). A day-flying moth endemic to Madagascar, it was originally described as a butterfly due to its resemblance to the swallowtails. The rainbow of colors on both upper and lower wing surfaces that make this species so sought after by collectors are not due to pigments, but result from the scattering and reflecting of light by microscopic ridges and pits on the highly curved scales covering the wings. The museum has several hundred specimens of this moth. It is relatively common in its native habitat, where it periodically undergoes massive one-way migrations when the hostplants for the caterpillar stage (they feed on trees in the spurge family) increase the amount of distasteful toxins in the leaves. Interestingly, after the migration has lessened pressure on the hostplant, the amount of toxins in the leaves subsides to normal levels. In the American tropics, a close relative, the green Urania moth (Urania fulgens), also makes mass migrations for the same reason. Learn more about moths and their relatives in a visit to the new Brown Hall of Entomology, a part of the Cockrell Butterfly Center– a living, walk-through rainforest at the Houston Museum of Natural Science. We are so glad you appreciate their beauty. Unfortunately, we do not have any of these butterflies to donate. We hold them here in trust for the public so that everyone can come and see them. Also, the government regulates giving out insects that are not native to the U.S.
At this time we do not have any live Madagascan Sunset Moths, but we have an excellent specimen pinned and on display in our butterfly center. We do have several live Atlas Moths flitting around the butterfly center, and those are similar to the Madagascan Sunset Moth. Come check them out! 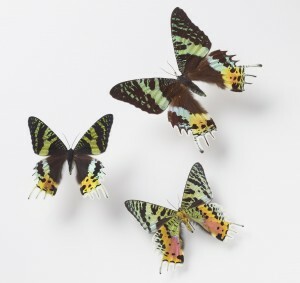 Hi,I was reading this article about the rainbow moth and in every article it says the moth is endemic to Madagascar.I lived as a boy in Dar-es -salaam,Tanzania and this moth was very common during the rainy season there,flying high in the Mango trees.So is it a new record? Previous Post The Unconquered Sun: Winter Solstice Today!